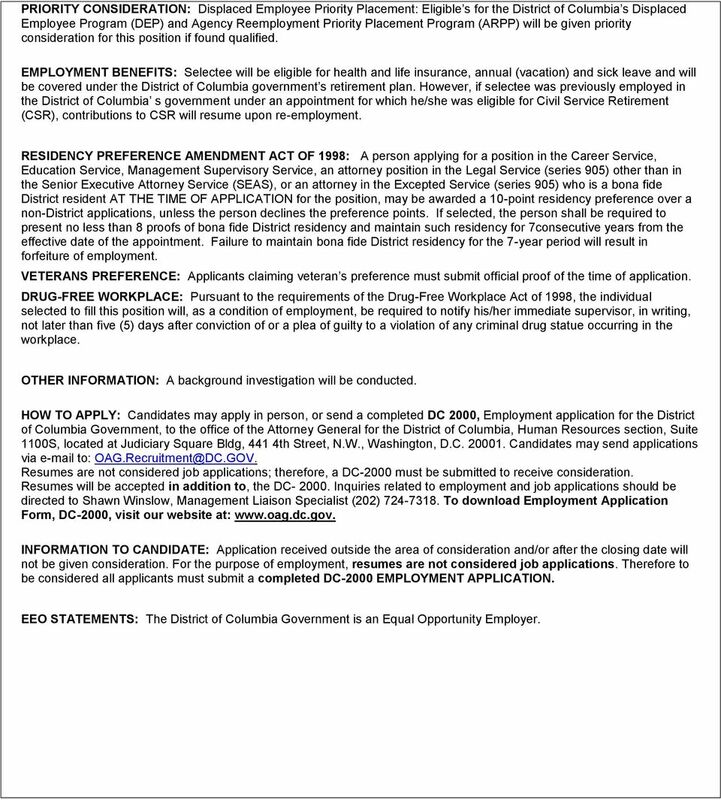 Download "D.C. OFFICE OF THE ATTORNEY GENERAL GOVERNMENT OF THE DISTRICT OF COLUMBIA POSITION VACANCY ANNOUNCEMENT"
2 assigned District employees and other contractors and consultants supporting applications development. Provides the supervision and guidance to subordinate staff by establishing work standards, designating work assignments, identifying developmental and training needs and evaluating work performance QUALIFICATIONS: Applicants must have at least one (1) year of specialized experience equivalent to the MS-15 grade level in the District of Columbia government service.. Specialized experience is experience that has equipped the incumbent with the particular competencies/knowledge, skills, and abilities to successfully perform the duties of the position and is typically in or related to the work of the position to be filled. Such experience is typically gained in the IT field or through the performance of work where the primary concern is IT. Substitution of Education: Candidates must have graduated from an accredited college or university with bachelor s degree with a major study in computer science, information science, information systems management, mathematics, statistics, operations research, engineering, or course work that required the development or adaptation of computer programs and systems and provided knowledge equivalent to a major in the computer field. The incumbent must have at least eight (8) years of specialized experience; at least one (1) year of the specialized experience must be equivalent to at least the MS-15 grade level in the District of Columbia government service. Specialized experience is experience that has equipped the incumbent with the particular competencies/knowledge, skills, and abilities to successfully perform the duties of the position and is typically in or related to the work of the position. field plus one to three (1-3) years of relevant work experience; or an equivalent combination of education and experience. An equivalent combination of education and experience is acceptable. SUBMISSION OF RANKING FACTORS: The following ranking factors will be used in the evaluation process. 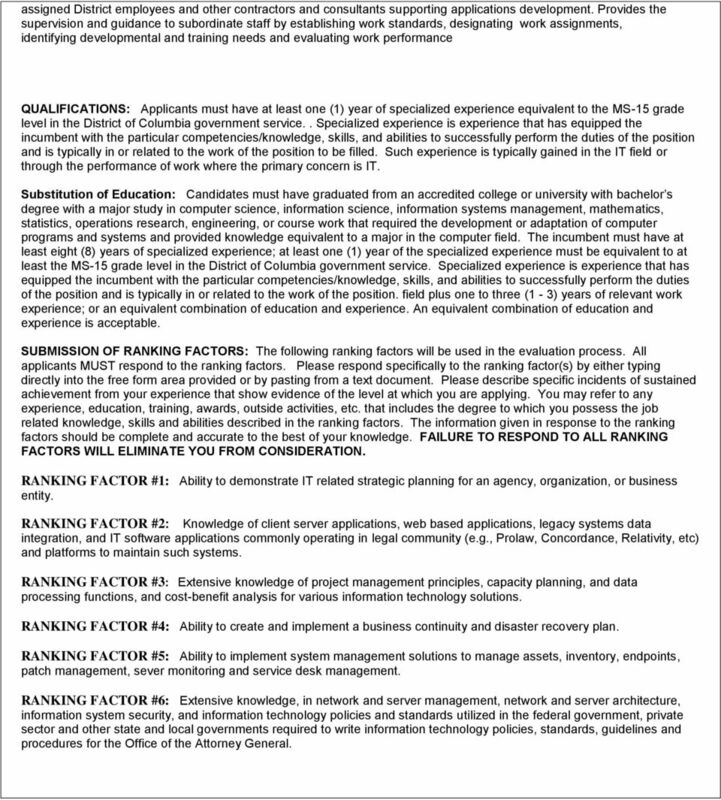 All applicants MUST respond to the ranking factors. 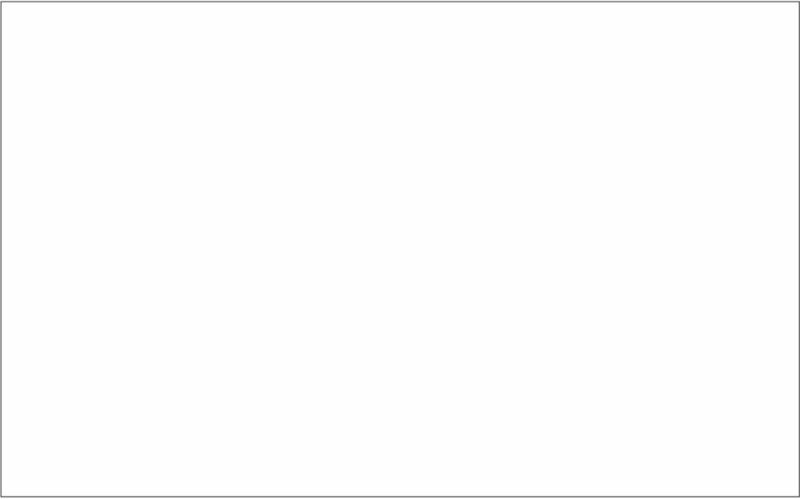 Please respond specifically to the ranking factor(s) by either typing directly into the free form area provided or by pasting from a text document. Please describe specific incidents of sustained achievement from your experience that show evidence of the level at which you are applying. You may refer to any experience, education, training, awards, outside activities, etc. that includes the degree to which you possess the job related knowledge, skills and abilities described in the ranking factors. The information given in response to the ranking factors should be complete and accurate to the best of your knowledge. FAILURE TO RESPOND TO ALL RANKING FACTORS WILL ELIMINATE YOU FROM CONSIDERATION. RANKING FACTOR #1: Ability to demonstrate IT related strategic planning for an agency, organization, or business entity. RANKING FACTOR #2: Knowledge of client server applications, web based applications, legacy systems data integration, and IT software applications commonly operating in legal community (e.g., Prolaw, Concordance, Relativity, etc) and platforms to maintain such systems. RANKING FACTOR #3: Extensive knowledge of project management principles, capacity planning, and data processing functions, and cost-benefit analysis for various information technology solutions. RANKING FACTOR #4: Ability to create and implement a business continuity and disaster recovery plan. RANKING FACTOR #5: Ability to implement system management solutions to manage assets, inventory, endpoints, patch management, sever monitoring and service desk management. RANKING FACTOR #6: Extensive knowledge, in network and server management, network and server architecture, information system security, and information technology policies and standards utilized in the federal government, private sector and other state and local governments required to write information technology policies, standards, guidelines and procedures for the Office of the Attorney General. 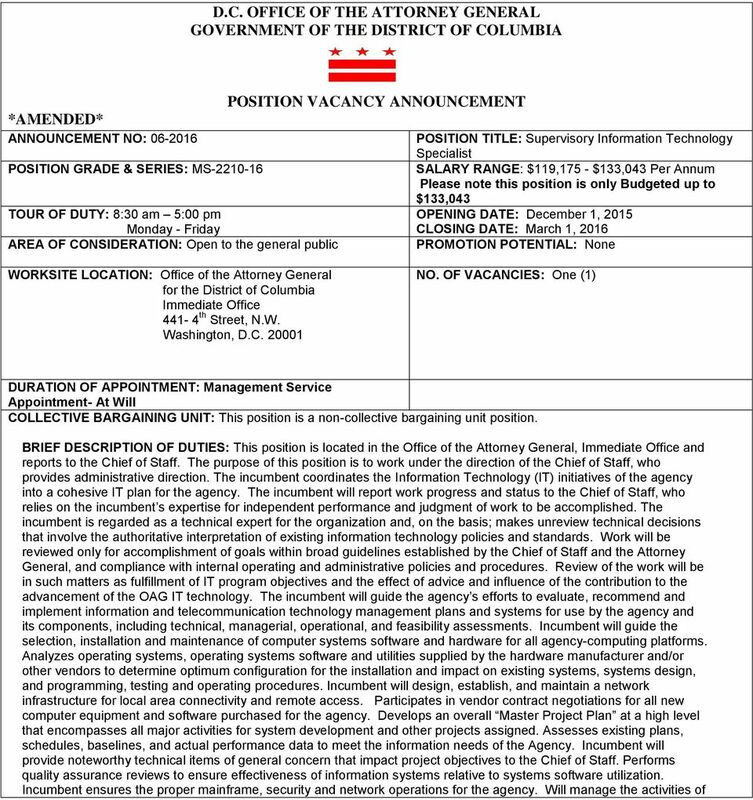 3 PRIORITY CONSIDERATION: Displaced Employee Priority Placement: Eligible s for the District of Columbia s Displaced Employee Program (DEP) and Agency Reemployment Priority Placement Program (ARPP) will be given priority consideration for this position if found qualified. EMPLOYMENT BENEFITS: Selectee will be eligible for health and life insurance, annual (vacation) and sick leave and will be covered under the District of Columbia government s retirement plan. However, if selectee was previously employed in the District of Columbia s government under an appointment for which he/she was eligible for Civil Service Retirement (CSR), contributions to CSR will resume upon re-employment. RESIDENCY PREFERENCE AMENDMENT ACT OF 1998: A person applying for a position in the Career Service, Education Service, Management Supervisory Service, an attorney position in the Legal Service (series 905) other than in the Senior Executive Attorney Service (SEAS), or an attorney in the Excepted Service (series 905) who is a bona fide District resident AT THE TIME OF APPLICATION for the position, may be awarded a 10-point residency preference over a non-district applications, unless the person declines the preference points. If selected, the person shall be required to present no less than 8 proofs of bona fide District residency and maintain such residency for 7consecutive years from the effective date of the appointment. Failure to maintain bona fide District residency for the 7-year period will result in forfeiture of employment. VETERANS PREFERENCE: Applicants claiming veteran s preference must submit official proof of the time of application. DRUG-FREE WORKPLACE: Pursuant to the requirements of the Drug-Free Workplace Act of 1998, the individual selected to fill this position will, as a condition of employment, be required to notify his/her immediate supervisor, in writing, not later than five (5) days after conviction of or a plea of guilty to a violation of any criminal drug statue occurring in the workplace. OTHER INFORMATION: A background investigation will be conducted. HOW TO APPLY: Candidates may apply in person, or send a completed DC 2000, Employment application for the District of Columbia Government, to the office of the Attorney General for the District of Columbia, Human Resources section, Suite 1100S, located at Judiciary Square Bldg, 441 4th Street, N.W., Washington, D.C Candidates may send applications via to: Resumes are not considered job applications; therefore, a DC-2000 must be submitted to receive consideration. Resumes will be accepted in addition to, the DC Inquiries related to employment and job applications should be directed to Shawn Winslow, Management Liaison Specialist (202) To download Employment Application Form, DC-2000, visit our website at: INFORMATION TO CANDIDATE: Application received outside the area of consideration and/or after the closing date will not be given consideration. For the purpose of employment, resumes are not considered job applications. 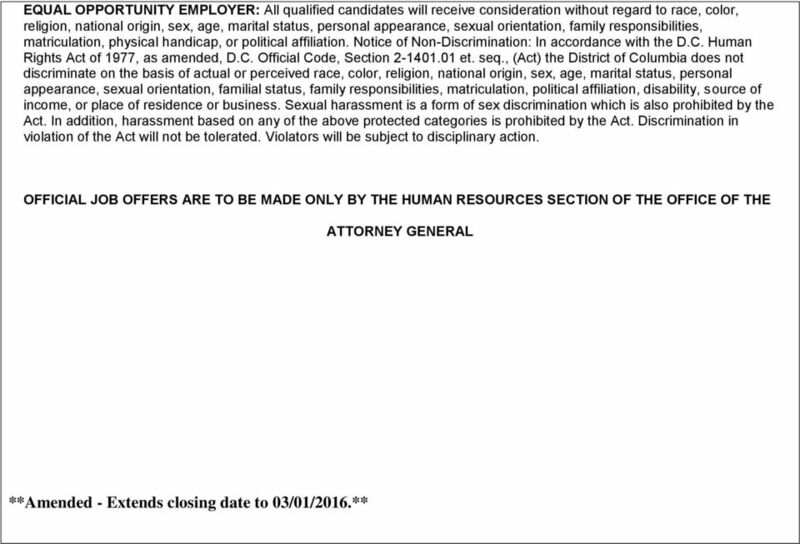 Therefore to be considered all applicants must submit a completed DC-2000 EMPLOYMENT APPLICATION. EEO STATEMENTS: The District of Columbia Government is an Equal Opportunity Employer.